Theodore Roosevelt was a passionate hunter. He loved the thrill of tracking and chasing game, the skill in marksmanship, the careful and deliberate recording of his observations about each hunt, the demanding—if smelly—preservation of specimens, and the pleasure of capturing in rich and vibrant language this ephemeral experience so that he could share it with the world. His first hunting trips were in the Northeast, in the backwoods of Maine with two men who became mentors and life-long friends, Bill Sewall and Wilmot Dow. 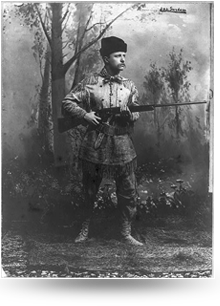 But the heart and soul of Roosevelt’s hunting experiences were in the American West, which he idealized in his 1885 book, Hunting Trips of a Ranchman. His love for the rugged beauty of the land and the vigorous hunting experience shaped his values for life. After leaving the presidency in 1909, Roosevelt cast further afield, embarking first on an epic 11-month, 2,500-mile safari through British East Africa and Anglo-Egyptian Sudan, and later conducting a harrowing expedition along Brazil’s uncharted River of Doubt. The African safari, commissioned as a scientific expedition by the Smithsonian Institution, involved trapping or shooting over 11,000 animals, including everything from insects to the largest of game—elephants, hippos, and white rhinos. Roosevelt and his colleagues also chronicled the wildlife and habitat of the region and collected specimens that formed the basis of the Smithsonian’s Natural History Museum collection. Several of these animals—displayed for many years in the Smithsonian—became widely known as iconic pieces of taxidermy. Roosevelt viewed hunting as both sport and an opportunity to further knowledge about a land and the species that inhabit it. Beginning with several pamphlets on birds in the Adirondacks and around his home in Oyster Bay, New York, he wrote book after book about his observations, including Hunting Trips of a Ranchman, Ranch Life and the Hunting Trail, and African Game Trails, to name just a few. All capture his awe of nature, love of the outdoors and knowledge of the species he hunted. As an adult, Roosevelt did not hunt just for the sake of killing, and was against senseless slaughter of animals. During one long, unproductive bear hunt in Mississippi, his guide tracked a bear and tied it to a tree so that the president could at least say he shot something. But Roosevelt refused to shoot the injured old bear, a scene that political cartoonist Clifford Berryman famously illustrated. After the cartoon appeared, a shopkeeper decided to call his toy bears “Teddy’s Bears,” and one of the most popular toys in the history of this nation was born.